John Bulloch Souter (1890-1972) was born in Aberdeen, Scotland where he studied at Gray’s School of Art. A travelling scholarship allowed him to visit the continent, where he was much impressed by Velasquez, Chardin and Vermeer. After serving in the Royal Medical Corps during World War I, he soon married and moved to London. It was during this post-war period that he made his name as a portrait painter; his subjects included such personalities as Ivor Novello, Gladys Cooper and Fay Compton. 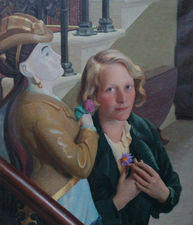 He exhibited at Redfern Gallery, the Fine Art Society, Royal Scottish Academy and the Royal Academy where his notorious painting The Breakdown was shown in 1926. During World War II he worked in the Censorship Department as a translator whilst also restoring paintings at Windsor Castle. He returned to Aberdeen in 1952, where he remained.